It may be hard for the NHL community to grasp, but it’s been nearly three years since the New Jersey Devils have qualified for the postseason. To put that in perspective, the team only missed two trips to the playoffs between the 1989-2012 seasons. What may be even harder to believe is that they have accomplished this feat with an unparalleled 13 different head coaches in that time span. 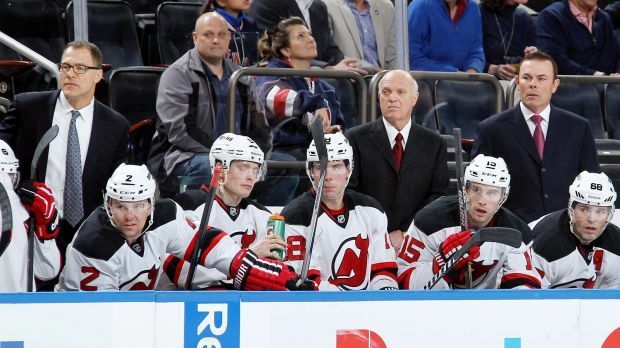 Lou Lamoriello however, is the one constant presence that the team has had. During his run as GM the Devils, Lou’s teams have made five trips to the Stanley Cup Finals, bringing the title home to the Garden State in 1995, 2000, and 2003. Since the Devils appearance in the 2012 finals, the teamed has been dormant. This brings us to today. After starting the season 12-17-6 the Devils made the call to fire Peter DeBoar and drag the franchise through yet another coaching change. In typical Devils’ fashion, the team opted to replace DeBoar with not one, not two, but three co-head coaches. On December 27, 2014 long time general manager announced that coaching tandem would be up of himself, former Washington Capitals head man Adam Oates, and long-time assistant and famed Ex-Devil, Scott Stevens. From a fan’s perspective, it would be quite simple to draw the comparisons of this season to the team’s campaign in 2010-2011. Merely two months into the season, the Devils parted ways with head coach John MacLean after starting the season with a 9-22-2 record. Lamoriello hired Jacques Lemaire to once again coach the team. Despite coming up with 61 points in 49 games the Devils fell just short of making the playoffs. Since the DeBoar firing, the three-headed-coaching-monster has proven to be very effective. The Devils have posted an impressive 18-11-4 record under the new regime. Fans have been treated to a career resurgence from Scott Gomez, the surprising play of Jordin Tootoo, and the world-class goaltending from Cory Schneider. This late push comes to a bittersweet moment for Devils fans who have blessed to witness postseason hockey on such a consistent basis. If the 2010-2011 campaign has taught us one thing, it’s that the Devils will come out swinging in the offseason and perhaps a return to prominence to follow. “I think that we have to get a couple of offensive forwards,” Lamoriello told NorthJersey.com on Tuesday. If successful sports franchises have taught us a lesson on consistency is most times the man in charge stays at the helm throughout their given reigns at the top and it is safe to say Captain Lou is not done yet.